So many things to see before I leave Beijing: the 1/750 model of the whole city in the Planning Exhibition Hall, Koolhaass immense CCTV tower now under construction, and of course the Olympic grounds. In this city its impossible to forget for a second about the upcoming 2008 sports event because of the big billboards, huge screens with futuristic films of Beijing, artists impressions and PhotoShop posters, and a giant countdown screen on Tiananmen Square. Everything is clocked accordingly. 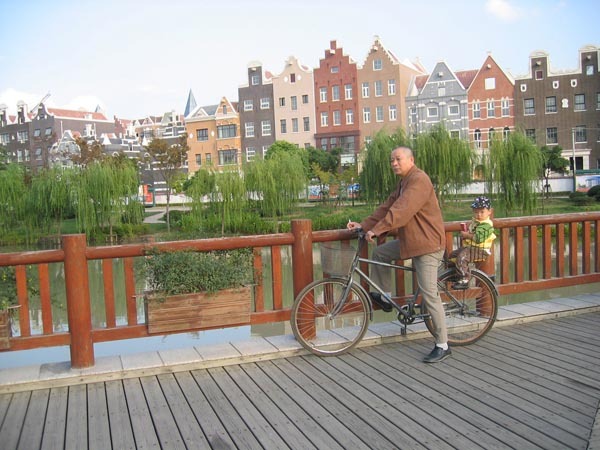 Of course, hutongs are a must see. 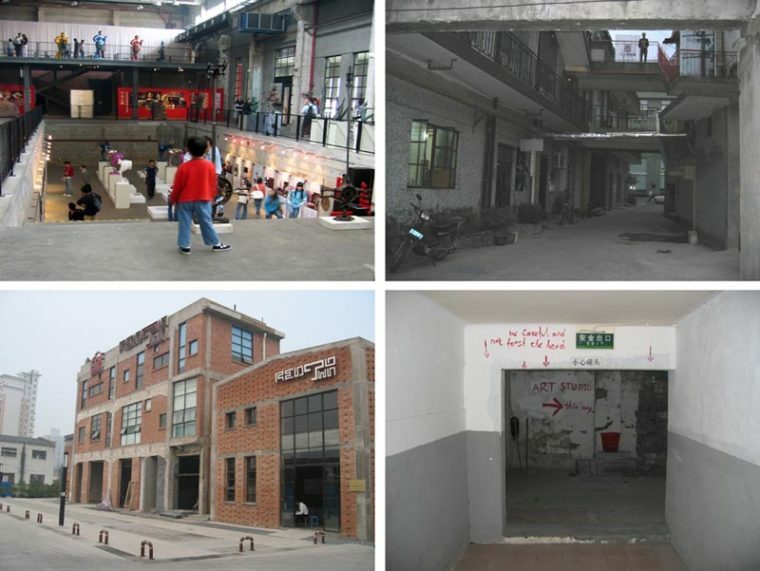 Its amazing to discover the rapidly growing number of hip luxurious hotels, restaurants and massage parlours in these traditional housing blocks advertising in English. Then on to Shanghai. It feels like a cross between Istanbul and Manhattan. Not enough words to describe the weird, brand-new Holland Village, one of the nine new towns around this mega-city. Creativity Holland is written on flags and billboards next to orange tulips. The solid concrete windmill, the enormous wooden clog, the Amsterdam-like main street with marble façades that are half original and half monumental, and a typical Dutch palace are almost finished. The rest is being constructed at full pace. The Bund, the Pudong highrise area, and the endless giant shopping malls are difficult to miss. More hidden and more interesting are neighbourhoods like M50, the Red Town and No 1 Factories. All of them are transformations of former factories and are home to artists and designers as well as to some retail and leisure developments. While Dutch cities are endlessly discussing how to become breeding grounds for the creative class, its inspiring to see these developments already realised and working in Shanghai. One thing is for sure: China keeps you fascinated. But how much of it have I seen anyway? Just like in the ancient Chinese story, I feel like the blind man touching only one part of an elephant, and trying to guess what it is. A tree trunk or a water hose? Quite an effort to constantly run from one meeting to another, fishing for as many worthy presentations as possible from the seven simultaneously held sessions. But the whole thing is rather bizarre. I know Im in a different world, but I only get to see flashes of it on the way from the hotel to the conference hall, and the rest is mostly lectures by Delft academics. 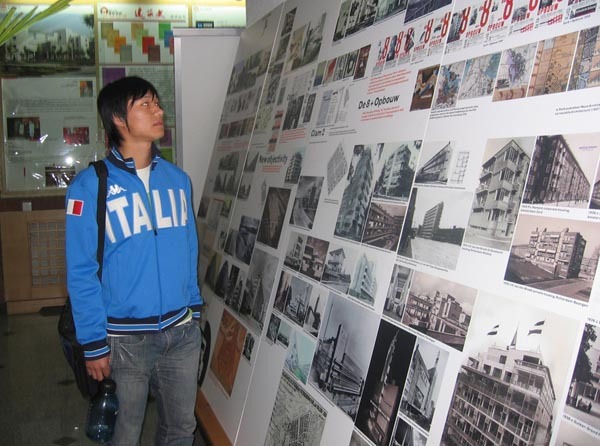 Even the panels depicting the history of Dutch architecture  fixed on the ground floor of the faculty building in Delft  are hanging in the hallway of the conference building in Beijing. Whats more, many of the Chinese students at the conference have been imported from the TU Delft. Where are the Tsinghua students? And how about China? Is there consistent and conscious local resistance rooted in the regions of China, standing up to the flattening forces from within the country or from outside? Just like other participants, Im becoming more and more curious about how this country moving at the speed of light deals with this reality. 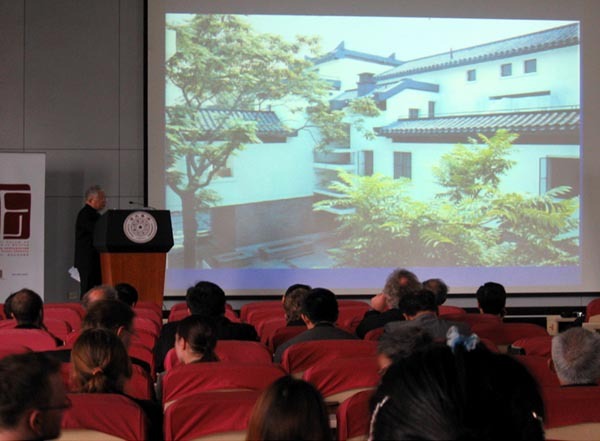 What was striking about some of the presentations by Chinese researchers was the rather polarised research atmosphere: either regionalism was understood as total preservation and repetition of what exists, or globalism was fully embraced without any criticism. The Noodles versus Magnum dilemma again. Not easy to come up with a meaningful synthesis of a locally beloved soup and a world-famous ice-cream. My own voice was heard in Beijing today, too. My first big congress experience as a budding doctorate researcher. Stop Ekim, your last 5 seconds! Kees Duivesteijn warns me without mercy after a few minutes even though theres still so much more to say. Thats what happens if 24 poster presentations have to be squeezed into 45 minutes in the margins of the forum. 6 a.m. I wake to the noise of nearby construction work mixed with the morning preparations of the hotel crew, which sound like a military exercise. This city is literally under construction. Walking to the conference hall I find out that one second of daydreaming can be hazardous in a morning rush hour teeming with people on bikes carrying huge mountains of wares, with tricycles, motorcycles, cars, trucks and buses. Im used to some wild walking in Istanbul, but believe me this is different. Next in line is Alexander Tzonis, who proves to be very successful in waking up the sleepy jetlagged audience. What else would you expect from a guy who worked in the theatre and movies in his early career? Peaks and Valleys in a Flat World. Regionalism creates diversity of regions and thereby counters the flattening power of globalism, argues Tzonis. 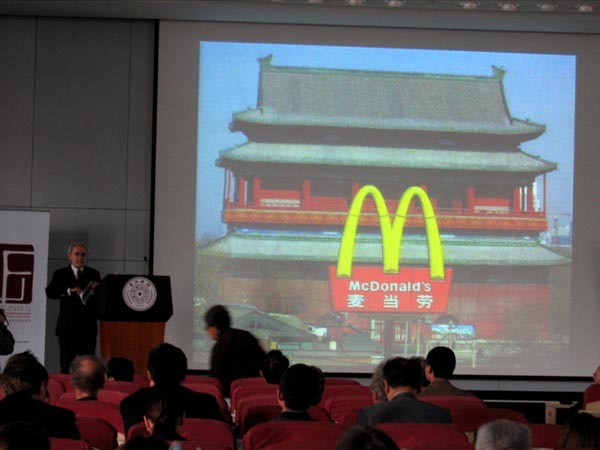 Globalism and regionalism in world architecture are long-term and complimentary forces. A lack of friction, he adds, means an absence of diversity and, hence, creativity. Are global forces, by definition, as flattening as Tzonis argues? Or does Mundialism (as I prefer to call it) embody the potential to define new and unexpected peaks and valleys? What would these mean for China? 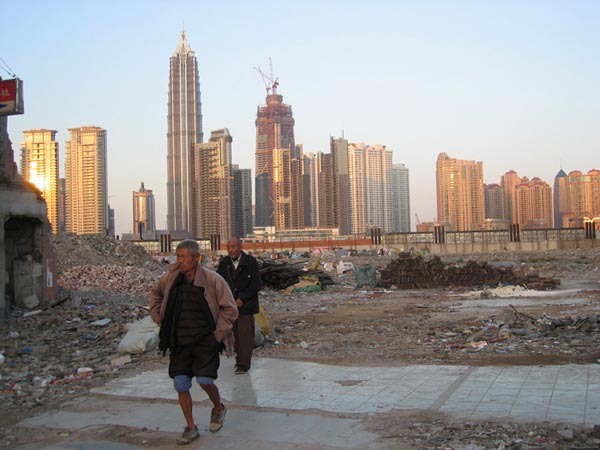 Will China in the near future become the new power, flattening the whole world? Those are the subjects of the evening discussions as we drink our Tsingtao beers at the round table with rotating dishes. Noodles or Magnum? What a choice I think half sleepily as I hear the stewardess in the distance. Slurping my noodles, Im impressed by the seemingly endless cinnamon coloured Gobi Desert down below. Having studied with many Chinese friends, Im extremely curious to learn about their country. But first, the real thrill is the International Forum on Urbanism (IFOU), an academic gathering on re-inventing the urban identity. Beijing, what a place to discuss the ongoing confrontation between modernisation and regionalism. The taxi driver proudly points to the impressive birds nest by Herzog & de Meuron, destined to be the eye-catcher of the 2008 Olympic City. China is indeed the place where everything is more and bigger in every sense; size, number, speed, noise… During the opening ceremony, held in a very basic university setting, hotshots from the TU Delft, Tsinghua University and NTU Taipei are welcoming everyone. Half of the faces are familiar. Theres a clear Delft wind blowing here. Then Im surprised to hear some clear Turkish. A German urbanist, head of the planning (urban housing) department in Berlin, addresses me in my mother tongue. For some reason he studied at my university, METU in Ankara. He hands me his card. Might be useful some day, he adds. Together with a former Dutch classmate, now working in Shanghai for KuiperCompagnons, I enjoy my first Beijing Duck surrounded by dozens of smiling Chinese girls.